What is the best Early Arabic Language Teaching Approach?! 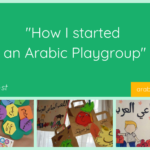 In this article, I introduce an approach to teach Arabic to little kids (under 7 years old) and suggest you play-based activities to practice Arabic with our free Arabic Story 1. – give them a head start in acquiring this language! My own experience in raising a bilingual child and the advises of Early Second Language Learning experts, make me believe in an approach based on play, daily life contexts, social interactions and whole-language exposure/immersion. In fact, young children effectively acquire a language by being exposed to it through fluent, rich and meaningful learning experiences. Teaching them list of isolated words or flashcards, without links between them, is denying their powerful brain’s mechanisms in learning a new language. Moreover, the use of a multi-modal approach is important to respond to each kind of learner: kinesthetic (physical), auditory, oral and visual. stimulating their powerful imagination and senses. making them practice the 4 skills of the language: listening, speaking, (pre-)writing, (pre-)reading. – props, puppets and flashcards/pictures representing the 2 kittens and the key words of the story; ex: picture of a park, bottle of milk, food toys for the onion, puppet for the fish etc..
Read aloud the story and involve more the children by acting it out (become a character). Use theatrical intonations, facial/body gestures and props/ puppets/pictures. – objects, stuffed animals, puppets and flashcards/pictures representing the 2 kittens and the key words of the story; ex: picture of a park, drawing of the sun, bottle of milk, food toys for the onion, puppet for the fish etc.. Hide the key words representations in the room and request the children to find them. To help them, you can show the picture from the mini-book while saying the word. Advice: You don’t need to teach every single word of the story. One by one, make them take an object from the box/bag and tell its name. Make groups of 2 children, or if you are a parent with one kid, play one of the kittens. And then, make them pretend to be Nashoot or Bannotn by repeating the whole dialogue or a part of it after you. Advices: It’s normal that children don’t say the sentences completely or with the exactly right pronunciation. The objective of this speaking activity is that they start to feel comfortable in speaking Arabic. They will improve with practice. Make a circle with the children and take a ball. Throw the ball to a child and ask him his name in Arabic. Let him answer (help him if needed) and then make him throw the ball to you. Continue with the other children. Make them write/trace their name in Arabic on a sheet. You can help them by writing dots for each letter. Tell the name of the letters while writing them. Activity related to the answer to “how old are you?” in Arabic in the story 1. It gives ideas to practice Arabic counting for feminine nouns in daily life. The characters count: – clouds from around 0:55 min. Watch it with the children and practice counting with the same nouns or others. What do you think about this approach? Do you already use it? Do you use an other approach to teach Arabic to young children? Do you have other ideas of activities ? Share & leave a comment below! — Emilie, cofounder of Arabic Seeds. wa laki khayru al jaza’, I am glad you found it useful! I love the cartoons from this website and my daughter too! I know that they are safe and the characters have good manners. she learned a lot of Arabic from them (of course I recommend to limit the time in front of the TV and other screens, and that one parent stays with the child to enhance the language learning). yay, jazakillah khair for the picture of the icon and explanation. Now I understand it much better. May Allah reward you for all you do.